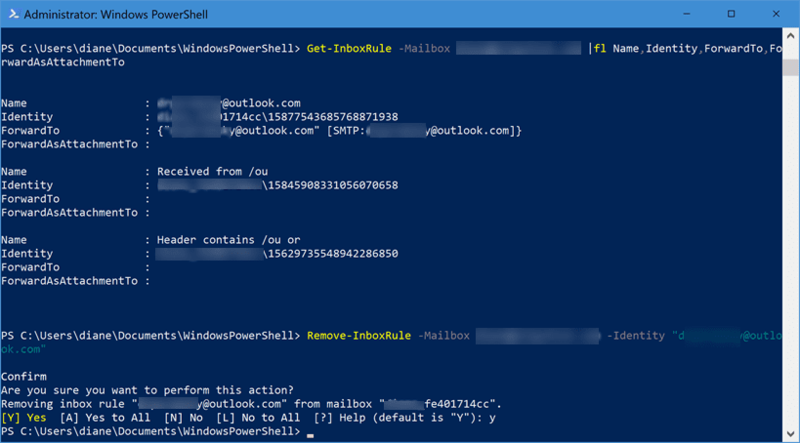 Remove-InboxRule -Mailbox user@domain.com -Identity "RuleName"
My own preference is to configure Exchange server to not allow automatic forwarding to the Internet, problem solved. 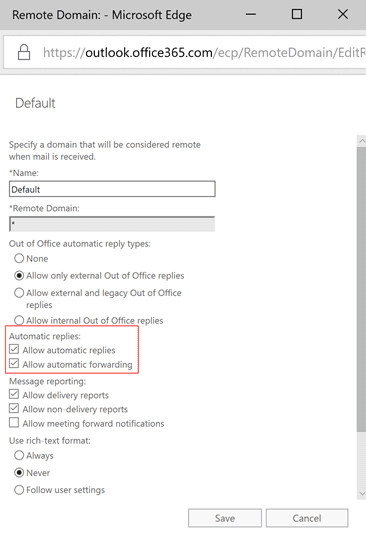 In Office 365 and Exchange 2013 and newer, disable forwarding to remote domains in the Exchange Admin center under Mail flow, Remote Domains. 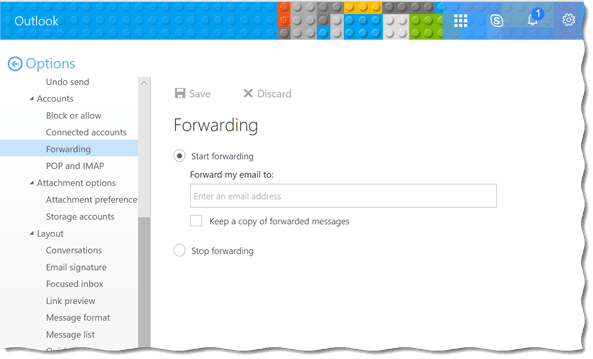 If This will allow you to block forwarding to all domains then create remote domains for the domains you need to forward mail to. Users can set up rules to forward mail, administrators can configure Exchange to prevent users from enabling forwarding rules. See Disable automatic forwarding in Office 365 and Exchange Server to prevent information leakage (TechNet) for the instructions. You can remove the rules from Outlook (any version) by starting Outlook with the /cleanrules switch. This requires you to open the user's profile in Outlook, which can be time consuming if you need to check a lot of mailboxes. It's not possible to do it using powershell. If you use the transport rule to redirect mail to a monitored address, you can use /cleanrules on those mailboxes that have forwarding rules configured. The final option is to either disable or delete the mailbox. If you need to continue monitoring the address, add the user's email address to another mailbox or public folder. Otherwise, allow the mail to bounce with an NDR or deliver it to a dropbox. Set-Mailbox -identity "Name" -MaxSendSize "0"
One of these solutions, or a combination, should solve your problem. I don't see "Remote domain" in Exchange Admin Center > Mail flow. I am using Exchange server 2013. If its not exposed in the UI, you'll need to use powershell to access it.